Privacy on a country lane just off county maintained road. Exceptional views of the very nearby Florida Mtns. Great neighborhood bar/restaurant/deli 2 miles; Deming shopping 12 miles. Electric to the property (to be provided by Seller). Approx 32 miles W of Las Cruces, exit I-10 at Akela. Cross over I-10 (to S side) and follow Hwy 549 W (initially Hwy 549 is S side frontage road). 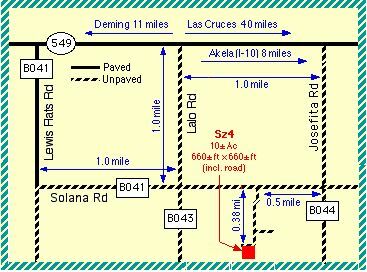 Approximately 7 miles W of Akela exit, turn left (S) off of Hwy 549 onto unpaved BO44 (Josefita Rd). 1 mile S of Hwy 549, turn right (W) onto unpaved Solana Rd (BO41). 0.5 mile W of Josefita Rd, turn S onto a country lane. Property (Sz4) is 3/8 mile S of Solana Rd on W side of the lane (S side has fence 1/2 mile S of Solana Rd). From NE Deming (S of I-10, in vicinity of Holiday Inn, Sisbarro Auto Dealership, etc), take Hwy 549 East. Approx 10 miles E of Deming turn right (S) off of Hwy 549 onto paved BO41. 1 mile S of Hwy 549 turn left onto Solana Rd (BO41). 1.5 mile E of Lewis Flats Rd turn S onto a country lane. Larger payments may be made at any time (and would be applied to principal, shortening term and saving interest). Seller pays costs of survey, title insurance and recording. Prices, terms, costs, conditions, representations & availability are subject to change. Representations and information provided are believed to be accurate, true and correct at time of publication; however, no warranty is made or implied. Copyright� 1999-2012 Adobe Lands, Inc. All rights reserved. Revised 15 February 2012.